Anti-Saloon League of Charlotte, N.C. It Helps Business and Is a Blessing. 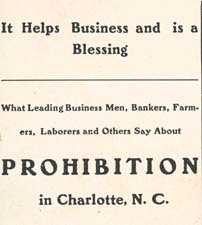 What Leading Business Men, Bankers, Farmers, Laborers and Others Say about Prohibition in Charlotte, N.C.
Charlotte, N. C.: Executive Committee of Anti-Saloon League, 1908. Local option -- North Carolina -- Charlotte. Prohibition -- Economic aspects -- North Carolina -- Charlotte. Prohibition -- North Carolina -- Charlotte.